Over seeding clover in food plots for deer can be done early spring or late fall. The timing is geared to let mother nature use her freeze thaw cycle to work the clover seed into the ground, and give us the necessary soil to seed contact for germination without working the ground. Over seeding clover in food plots for deer is quite simply the easiest perennial food plot for deer to establish without using farm equipment. One only needs a hand sprayer, and a hand crank seed spreader to establish clover on trails, small plots in the woods, or in pieces of old field or agriculture ground we have permission to plant on. Many of the grasses our clover will be competing with can be successfully and easily killed in the fall when we over seed clover. A non selective herbicide such as Round Up or any Glyphosphate can be used on the grasses the same day we spread the seed. Fall is the time of year when plants are storing and transferring energy to their root systems, and as long as the grass is still green, the transfer is occuring. Spray the grass at 1 quart of herbicide per acre at least 24 hours before the next rain, and over seed clover the same day. The grass will die, and mother nature will be working your clover seed into the soil with every freeze and thaw over the next 5 months. We can use this system to over seed clover anyplace we want food plots for deer as long as the soil will grow a clover plot, and the area receives adequate sunlight. Once you establish these clover plots, some of the smaller sized kill plot areas will require an annual or every other year over seeding of clover. The smaller size and constant pressure on these plots can stress the plants, and we need to help the area out by introducing ambitious young plants to the food plot. 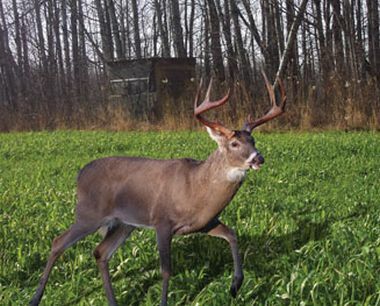 Examine your exclusion cage and if the browse pressure is heavy, plan over seeding clover and don’t forget a good fall fertilizer application low on the nitrogen and higher on the P and K to strengthen the root system of your clover food plots for deer. If this is your first venture in planting food plots for deer, take this nugget to heart. Measure the size of the plot accurately and use a very low setting on your hand crank seed spreader when over seeding food plots for deer. Using too much seed is a top 3 mistake when planting food plots for deer. If it says 4 lbs an acre 6 is not better. Neither is 7. The seed count is determined by experts in agronomy, not an armchair plotter who thinks they know more. Set the spreader low and cover the same area 3 times if need be, but don’t lay it down too thick as you will run out of seed, and the areas you over seed clover in will choke themselves out. Over seeding in clover food plots for deer is one of the easiest food plots for deer you can plant. A hand spreader and a hand sprayer will get you a successful start into the wonderful world of deer plotting but be careful- we consider over seeding clover in food plots for deer a gateway drug that may lead to full scale plotting, and that can get expensive.